Super-massive, super-hot, shedding atmosphere via light-driven stellar wind. A difficult stretch-goal. RCW 58 in Carina is seriously faint. It shows much detail in H-alpha (5 hrs, yellow). There are many radial structures reminiscent of the cometary knots in the Helix. Close in at 2pm there are two smoke-rings reminiscent of the "loudspeaker" structure in a similar position in the Norma bipolar nebula. 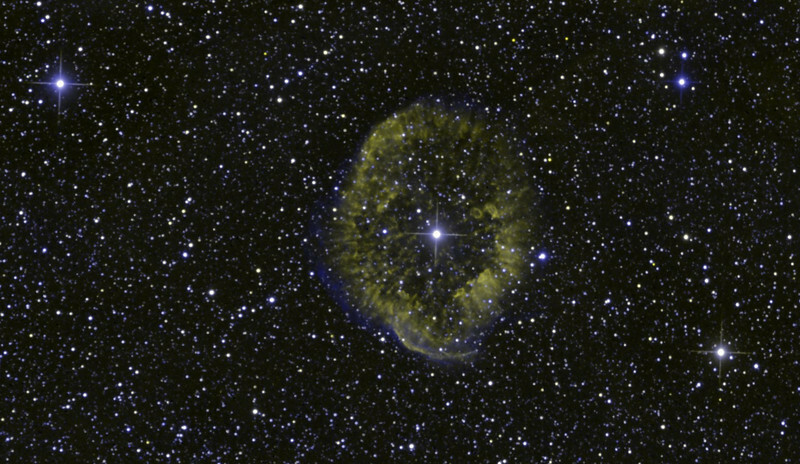 The nebula is weaker in O-III (6 hrs, blue), which appears as a subtle blurry ring, strongest toward bottom left and unusually, outside the H-a emission. SII emission was too weak to bother including. 2x2 binned. STL-11000M on 20" PlaneWave CDK on heavily modified MI-750 mount. Image width 28 min arc.